By Vladimir Putin – Mission of Russian Federation to European Union October 10, 2011 – It took Europe 40 years to move from the European Coal and Steel Community to the full European Union. The establishment of the Customs Union and the Common Economic Space is proceeding at a much faster pace because we could draw on the experience of the EU and other regional associations…. We plan to go beyond that, and set ourselves an ambitious goal of reaching a higher level of integration – a Eurasian Union…. We believe that a solution might be found in devising common approaches from the bottom up, first within the existing regional institutions, such as the EU, NAFTA, APEC, ASEAN inter alia, before reaching an agreement in a dialogue between them. These are the integration bricks that can be used to build a more sustainable global economy. Sputnik (Russia), April 14, 2016 – The introduction of a single currency for the Eurasian Economic Union is a big question, but possible once the economic situations in the member states even out, Russian President Vladimir Putin said Thursday…. Russian Union of Industrialists and Entrepreneurs vice president Alexander Murychev argued late in 2014 that economic integration within the EEU would help member state economies reduce their dependence on the dollar and the euro. Tengrinews (Kazakhstan), Nov 25, 2015 – Creation of a common unit of account – a supranational currency – for the Eurasian Economic Union (EEU) has been a controversial issue since 2011. Today, Russia is once again actively considering introduction of a common monetary unit for the EEU, while Kazakhstan does not seem so eager to move forward with this project. Chairman of State Duma’s CIS Committee Leonid Slutskiy talked about naming the provisional common unit of account of the EEU evraz. 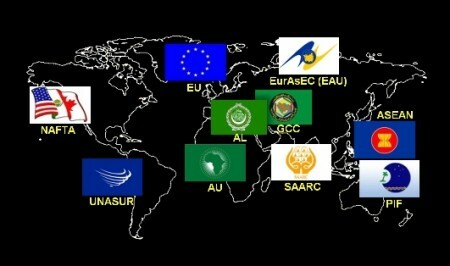 The Eurasian Economic Union (EEU) is an economic union of states located primarily in northern Eurasia. It initially included Russia, Kazakhstan and Belarus, and was later joined by Armenia and Kyrgyzstan. The Eurasian Economic Union has an integrated single market of 183 million people and a gross domestic product of over 4 trillion U.S. dollars. The EEU introduces the free movement of goods, capital, services and people and provides for common transport, agriculture and energy policies. Tass (Russia), Nov 18, 2015 – Russian Prime Minister Dmitry Medvedev has voiced confidence that preferential bilateral agreements must not replace the global trade system. “Russia has consistently advocated the deepening regional integration. All preferential trade agreements reached within its framework are important, of course, but, nevertheless, they should not replace the multilateral trade system. Moreover, they should not destroy the existing economic ties, they should only enrich them,” Medvedev said speaking at the APEC CEO summit. He recalled, in particular, that the Eurasian Economic Union (EAEU) had existed for almost a year now, adding that it comprised five full-fledged members. “We are committed to establishing mutually advantageous cooperation with all partners across the globe. This is our contribution to such integration,” Medvedev said. “There are agreements with our Chinese partners on harmonizing the integration processes within the framework of the Eurasian Union with the Silk Road economic belt.” According to the Russian prime minister, a preferential agreement was signed in May between the EAEU and Vietnam. Work on similar agreements with other countries is in progress. PanARMENIAN, Nov 13, 2015 – The issue of Iran’s accession to the Eurasian Economic Union (EEU) may be settled within 2-3 years, the country’s Minister of Communication told RIA Novosti on Thursday, November 12…. The Eurasian Economic Union is an economic union of states located primarily in northern Eurasia. A treaty aiming for the establishment of the EEU was signed on May 29, 2014 by the leaders of Belarus, Kazakhstan and Russia, and came into force on January 1, 2015. Treaties aiming for Armenia and Kyrgyzstan’s accession to the Eurasian Economic Union were signed on October 9, 2014 and December 23, 2014, respectively. Armenia and Kyrgyzstan’s accession treaties came into force on January 2, 2015 and August 6, 2015. Wall Street Journal, Oct 11, 2015 – While all eyes are on Vladimir Putin’s machinations in Syria, deploying Russian fighters and troops, a potentially more dangerous Moscow effort in Iran is picking up steam…. The development is most threatening for America’s allies in the Gulf Cooperation Council, including Saudi Arabia, Kuwait and the United Arab Emirates. Tehran seeks to dominate the six Arab states along the Persian Gulf’s western coast. Their best deterrent is their small but capable air forces. Both Syrian and Iranian officials have expressed an interest in joining Putin’s Eurasian Union. TASS (Russia), Dec 16, 2015 – The new integration association — the EAEU — started operating on January 1, 2015. Russia, Belarus, Kazakhstan, Kyrgyzstan and Armenia make part of the EAEU…. Vestnik Kavkaza (Russia), Feb 3, 2016 – Tehran is considering an opportunity for joining the Eurasian Economic Union, Ali Najaf Hoshrudi, the Ambassador of Iran to Kyrgyzstan, said. According to the Iranian diplomat, Iran is negotiating on cooperation with the EAEU…. Such developments seem quite realistic, considering views by experts who say that the US is gradually leaving Central Asia. Belarus News, Dec 2, 2015 -Infrastructure projects may become a good basis for a long-term successful and multipronged economic cooperation between the member states of the Eurasian Economic Union (EEU), Chairman of the Eurasian Investment Council Alexander Dolgov said at the Second Eurasian Economic Congress in Moscow on 1 December, BelTA informs. Belarus News, Nov 5, 2015 – Integration will help withstand global economic challenges, Belarus’ Premier Andrei Kobyakov said…. According to Andrei Kobyakov, today many countries are facing crisis developments in the economic sector…. “Integration should be comprehensive and well-balanced – in trade, investment and the financial sector. It is important to promote a wide economic integration in the CIS, the Eurasian Economic Union, and the Union State,” he said. It is equally important to develop a full-fledged financial market and harmonize the legislation in all its segments, be it banking and insurance sectors, the securities market. “One more thing is the setting up of big companies and the implementation of large projects. Here, the government has necessary instruments, for instance, guarantees, modern financial services,” he added. RT (Russia), July 21, 2015 – The Syrian Prime Minister Wael Halqi has said joining the Eurasian Economic Union (EEU) will allow Damascus easier economic and trade cooperation with friendly nations…. According to the prime minister, Russia and Syria have signed a number of contracts for the construction of gas processing plants, irrigation facilities and power stations. In 2013, an agreement was signed for Russian companies to develop oil fields on the Syrian coast. The first phase is worth $88 million and will last for five years. The countries are also discussing the expanding of loans to Damascus. By Alex Newman, The New American, Sept 23, 2014 – ….But what if everything is not quite as it seems? What if — despite the “East vs. West” and “New Cold War” hysteria whipped up by politicians and the mainstream media — both sides are actually working toward the same goals using largely the same means? Sounds impossible, right? The evidence, however, suggests it is not only possible — it is exactly what is happening…. Putin’s saber rattling over Ukraine is providing a rationale for continued Western integration — via the EU, NATO, and the “transatlantic partnership” — to counter the Russian bear. But in addition, Putin is also pursuing a “New World Order” via the regionalization approach. Chief among the schemes, for now at least, is the “Eurasian Union,”…. Will Former Soviet Republics Adopt A Single Currency? Nasdaq, June 8, 2015 – On May 29, at a summit in Kazakhstan, Russian Prime Minister and former President Dmitry Medvedev announced that the Eurasian Economic Union (EEU) would “consider the possibility and conditions of launching a monetary union in the long term.” …. Russia’s partners in the newly formed EEU are nervous about Putin’s ambitions and, at least when it comes to their domestic audiences, wish to be seen opposing the single currency. On the other hand, Russia has extensive leverage over these governments, whose economies are tied to Russian gas and remittances sent by migrants working in Russian cities. Russia and China have taken ‘concrete steps’ to unite the New Silk Road with the Eurasian Union. Sputnik (Russia), July 16, 2015 – ….But if the ‘Silk Union,’ which is primarily an economic project, plays an economic part, then the Shanghai Cooperation Organization, which was recently joined by India and Pakistan, is serving a geopolitical and strategic role…. The [SCO] now brings together almost as many nuclear powers as the UN Security Council, and the prospect of Iran’s membership will further strengthen this tendency…. The organization’s security goals, among which are the fight against terrorism and extremism and cooperation to act as sort of a counterweight to NATO, is quickly widening. PressTV (Iran), May 30, 2014 – The economic union signed this week between Russia and its near neighbors, Belarus and Kazakhstan, spells another nail in the coffin of the waning US global hegemony. Russian President Vladimir Putin signed off on the Eurasian Economic Union in the Kazakh capital, Astana, along with his counterparts, Alexander Lukashenko and Nursultan Nazarbayev…. This Eurasian alliance could also in the near future include other energy giants, such as Iran and Azerbaijan. 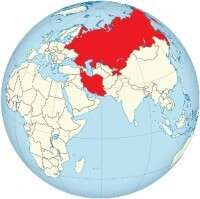 Iran to change configuration of Eurasian Union – Vestnik Kavkaza (Russia), Sept 11, 2014 – Iran could become a new participant in the Eurasian Economic Union. Experts came to such a conclusion after the negotiations between the president of Iran, Hassan Rouhani, and of Kazakhstan, Nursultan Nazarbayev. The two heads of state discussed prospects of cooperation between the Customs Union and the Islamic Republic of Iran. RIA Novosti, Oct 28, 2014 – “Outside of Iran, in its external politics, Iranian-Russian and Iranian-Chinese relations will be activated [if the agreement is not signed]. I don’t exclude an agreement resembling an alliance. It will show that Iran doesn’t just need the United States,” Safarov said, noting that this could also lead to Iran entering the Shanghai Cooperation Organization and the Eurasian Economic Union. “From being competitors, we will become energy allies. Russia is interested in this,” he added. OE Watch Commentary: In February 2013 the Iranian Foreign Ministry organized a two-day seminar in Tehran entitled, “Iran and Regional Cooperation in Eurasia.” Iranian Foreign Minister Ali Akbar Salehi spoke at the event. According to the accompanying articles, he indicated Iran’s interest in joining the Russia-led Eurasian Union and spoke of Iran’s usefulness to the development and expansion of “Eurasianism.” Mainstream media both in the West and in Russia had not reported on this statement. It is worth considering. Seizing the Eurasian moment – The Star (Malaysia), July 12, 2015 – The way Washington has managed to alienate China and Russia at the same time has helped develop their partnership…. Russia and China were thus prodded by the US to work more closely together…. Russia places a special priority on the Eurasian Economic Union (EAEU), which also covers Armenia, Belarus, Kazakhstan and Kyrgyzstan, with Russia dominant. China has prioritised its Silk Road Economic Belt initiatives linking Asia with Europe. Working together, the EAEU and the Silk Road projects would be promoted jointly by the SCO. ‘Western sanctions against Russia may boost Eurasian Economic Union’ – RT (Russia), March 20, 2014 – What would then happen is that the Eurasian Economic Union would accelerate in scale very rapidly. And Russia’s ties with China and India or Iran would not be negatively affected at all. Also, Russia would not play ball with the US and Western Europe on energy issues. This could backfire very badly on the West. Single Currency Talk: Armenia’s ex-PM says common payment system key to future Eurasian Union – ArmeniaNow, April 14, 2014 – “The new currency is likely to be introduced not later than in 2025, although international economic sanctions against Russia may cut the process to 3-5 years,” writes the Moskovsky Komsomolets newspaper, citing a source in the Eurasian Economic Commission. Eurasian Economic Union plans to adopt common currency unit – ITAR-TASS (Russia), Aug 3, 2014 – Processes of financial integration within the Eurasian Economic Union “are especially important now that the European Union and the United States have imposed sanctions against Russia’s financial sector – Sberbank, VTB, VEB, Gazprombank and Rosselkhozbank,” the Rossiiskaya Gazeta notes…. The Union is to supersede the Common Economic Space of Belarus, Russia and Kazakhstan on January 1, 2015. Two more countries of the Commonwealth of Independent States (CIS), Armenia and Kyrgyzstan, have announced their plans to join the Union. South China Morning Post, July 16, 2014 – The leaders of Brazil, Russia, India, China and South Africa also formalised the creation of a US$100 billion currency exchange reserve, which member states can tap in case of balance of payment crises, according to a statement issued at a summit in Fortaleza, Brazil. Each member of BRICS is itself a dominant “anchor nation” of a major regional bloc of nations, except China (currently considered a region in itself): Brazil, UNASUR: Russia, Eurasian Union; India, SAARC; and South Africa, African Union. Belarusian Telegraph Agency, April 11, 2014 – In his words, the norm is envisaged in the draft Eurasian Economic Union Treaty. Citizens of the Union member states will be freed from getting a permit to work in the country of employment. Employee insurance for the workers of the EEU member states bears a special significance in the future establishment of the common labor market. Vestnik Kavkaza (Russia), Feb 4, 2015 – Sergei Markov, a member of the Public Chamber of Russia, the director of the Institute of Political Studies, doesn’t exclude that the issue of Turkey’s access to the Customs and Eurasian Union will be formed, as Ankara has no chances of becoming a member of the EU. Vestnik Kavkaza (Russia), Jan 1, 2015 – Russia, Belarus and Kazakhstan are stepping up to a new level of integration. Free movement of commodities, services, capital and the labour force has beer launched inside the EaEU countries. The sides should provide coordinated policy in key economic spheres. In 2016 they should establish a united market of medicines. RIA Novosti (Russia), May 29, 2014 – “The project of Eurasian integration was created on the basis of two matrixes – one is the WTO principles, another is the experience of the European Union in order to get in close cooperation with Europe…. The EU cannot see the Eurasian Economic Union as a real partner. They say Russia is dominating it, they all try to bargain the benefits and thus work on a county-to-country basis.”…. On Thursday, the leaders of Russia, Belarus and Kazakhstan signed the Eurasian Economic Union Treaty that will enter into force January 1, 2015. The treaty will bring the three countries to a higher level of integration, including commitments to guarantee the free movement of goods, services, capital and labor as well as the implementation of coordinated policies in key sectors such as energy, industry, agriculture and transport. Russia ready to collaborate with all Latin American countries – Putin – Voice of Russia, July 11, 2014 – In May, we signed the Agreement on Establishing the Eurasian Economic Union, which will come into force on January 1, 2015,” he said. In his opinion, this will create one of the world’s biggest common markets with a population of almost 170 million and free movement of capital, goods, services, and labor. This market operates on the basis of universal principles and WTO norms and rules. Why Belarus wants to bring ‘serfdom’ back – The News Journal (Delaware) | Gannett, June 9, 2014 – Lukashenko last week agreed to sign a new decree that would forbid workers on collective farms from leaving to pursue jobs elsewhere. The Belarusan dictator was open about what he was talking about, saying the decree was “about, let’s speak frankly, ‘serfdom.’” …. Lukashenko’s statement came around the same time that Belarus joined with Russia and Kazakhstan to form Eurasian Economic Union. Nazarbayev invites Turkey to join Eurasian Economic Union – Tengrinews (Kazakhstan), June 6, 2014 – Kazakhstan’s leader Nursultan Nazarbayev has invited Turkey to consider joining the Eurasian Union, Tengrinews correspondent reports citing the official website of the president. Notes on the Future Court of the Eurasian Economic Union – Moscow Times, April 28, 2014 – According to publicly available information, the final draft of the agreement on the Eurasian Economic Union (EAEU) should be ready for signature by May 2014…. While the current draft appears to be silent on details of judicial authorities of the EAEU, it is quite evident that the new Court of the EAEU (Union Court) will soon be in charge of dispute resolution and interpretation of the legal order within the CU/CES and EAEU itself. Russian war cries herald rise of George Orwell’s Eurasian vision – The Australian, April 20, 2014 – To the uninitiated he might sound like a crackpot with his talk of a “Eurasian empire” stretching from Vladivostok to Lisbon, like the neo-Stalinist superpower in George Orwell’s Nineteen Eighty-Four…. It is called Eurasianism, a dogma inspired by fascism and Stalinism that is intended to answer Russians’ nostalgia for empire and yearning for a strong national identity. In the Eurasianist view, the motherland is threatened by a western conspiracy known as Atlanticism to which it must create a bastion of “Eurasian” power. Orwell’s fiction is now being played out as Henry Kissinger’s “new mercantilism” of “competing regional units” has begun. Emerging regional blocs around the world are designed to conflict and compete with one another to consolidate the power and resources of each bloc’s member nations into centrally controlled, intensely surveilled regional jurisdictions. Eurasian economic union with Russia at centre of Putin’s endgame – The Australian, March 4, 2014 – In addition to the geostrategic importance of Ukraine, getting Kiev on side is critical to the success of Putin’s proposal for a Eurasian Economic Union. Such a union will exist as a counter to the EU and allow Moscow to institutionalise Russia’s influence. If realised, the Russian-dominated union would also potentially control one-third of the world’s proven natural gas reserves. Ukraine’s EU ‘U-turn’ dominates East Europe talks – France 24, Nov 28, 2013 – Ukraine’s decision to scrap a planned trade agreement with the European Union following pressure from Moscow has darkened the mood as a summit between EU and Eastern European leaders gets under way Thursday in Vilnius. Ukraine chooses to strengthen ties with Russia and reject historic trade deal with EU – The Independent (London), Nov 21, 2013 – The Ukrainian government has stunned the European Union by announcing it was stepping back from a trade deal with the bloc and would instead pursue greater ties with Russia, hours after refusing to meet EU demands to free jailed former prime minister Yulia Tymoshenko. Ukraine Suspends Europe Trade Talks, Turns to Russia – Atlantic Sentinel, Nov 21, 2013 – A “European” Ukraine would have dashed Putin’s hope of turning the customs unions into an Eurasian Union that could compete with Europe’s. By keeping Ukraine in its sphere of influence, Russia maintains a foothold in Europe, indeed, a European identity, whereas the alternative, an Eurasian Union that includes only Central Asian republics besides Russia, would relegate it to a less pivotal role in world affairs. How We Can Help Ukraine – National Review, Jan 2, 2014 – Vladimir Putin might be interested in pursuing his adviser Alexander Dugin’s dream of constructing a fascist “Eurasian Union” ….He envisions the creation of a Eurasian bloc, including not only the republics of the former Soviet Union, but also Germany, Central and Eastern Europe, Turkey, and Iran, united under the iron heel of a new totalitarian “fourth political theory” to oppose the West. According to Dugin, who bases most of his allegedly novel synthesis of Communism and Fascism on the geopolitical, legal, philosophical, and occult ideas of Nazi theorists Karl Haushofer, Rudolf Hess, Carl Schmitt, and Arthur Moeller van der Bruck, such a “Eurasist” continental block is needed to defeat the nefarious influence of the secret “Atlantic Order,” or “Atlantis” — the global mercantile maritime/cosmopolitan conspiracy…. The rate of integration of other fascist regional blocs will only accelerate in 2014, in response to the emergence of the Eurasian bloc. EU concerned by Armenian plans to join Russia’s Customs Union – News AZ (Azerbaijan), Sept 12, 2013 – The unpredictable decision by Armenia’s President Serzh Sargsyan that Yerevan will join a customs union with Russia has raised doubts over Armenia’s EU integration path and caused concern in Brussels about Europe’s relations with its eastern neighbours. Interview: Georgian PM Still Aiming For EU, But Doesn’t Rule Out Eurasian Union – Radio Free Europe, Sept 9, 2013 – He told Koba Liklikadze from RFE/RL’s Georgian Service that he will not exclude the possibility that his country could one day join the Eurasian Union, an economic and political body proposed by Russia that would bring together some former Soviet nations. Russian FM Lavrov on prospects of a single currency in the Eurasian Economic Union – Embassy of Russia to the UK, October 9, 2012 – Certainly, this is not an immediate task; however, it will appear on our long-term integration agenda. Meanwhile, transition to payments in national currencies between Russia and our partners in the Eurasian area, Asia and other regions of the world is high on today’s agenda. Euro Crisis Gives Impetus to Eurasian Common Currency Discussion – Moscow Times, June 17, 2012 – Portansky said wooing Ukraine into the customs union would bring the introduction of the common currency closer because it would significantly boost Russia’s mutual trade with other bloc members. Creating a single currency will mark the final stage of forming the Eurasian Union and help strengthen the bloc, Stanislav Bogdankevich, former chairman of the National Bank of Belarus, told RIA-Novosti on Friday. Positive opinion in Russia’s parliament about a common currency in the Eurasian Union – Russia-media.RU, June 18, 2012 – After the introduction of a common currency the Eurasian Union will be a real supranational union. Otherwise, it remains still as an “initiative that exists in the papers”, underlined Slutski. “We need a common currency, common language, common borders, common law and a unified parliament” he added. Medvedev considers introduction of single currency in Eurasian Economic Union – Voice of Russia, June 15, 2012 – Russian Prime Minister Dmitry Medvedev has suggested considering the introduction of a single currency in the Eurasian Economic Union that’s due to be set up by five CIS nations by January 1st, 2015. Karasin arrives to discuss common currency – Charter ’97 (Belarus), Jan. 31, 2012 – The issue of currency of the Common Economic Area was discussed at a meeting of State Secretary, Deputy Foreign Minister of Russia Grigory Karasin with Belarusian MFA representatives in Minsk on Monday. “The financial aspect was among the topics: the future of the ruble and if the new currency is needed for the Eurasian Economic Union,” Karasin told journalists, Interfax-Zapad news agency reports. Russia, Belarus, Kazakhstan may have common currency in future – Putin – RIA Novisti (Russia), Dec. 15, 2011 – Russia, Belarus and Kazakhstan may introduce a single currency in the future within the Eurasian Economic Union between the three former Soviet republics, a new entity meant to promote cooperation both with Europe and the Asia-Pacific region, Russian Prime Minister Vladimir Putin said on Thursday. Lukashenko: New Single Currency should Operate within CES – Telegraf.by (Belarus), Jan. 19, 2012 – President of Belarus Alexander Lukashenko believes that some new currency like the euro should be created in case of single currency introduction within the Common Economic Space of Belarus, Russia and Kazakhstan. “The Russians, Kazakhs and we, Belarusians, agree on the fact that it’s quite a normal practice,” said the President in an interview with the Chinese media on January 17….The Head of State also notes that the progress made in November 2011 is not the last stage of integration, so the CES countries will seek closer cooperation within the Eurasian Union. Moody’s issues annual report on Eurasian Development Bank – Finanzen.net (Germany), October 23, 2012 – EDB began operations in June 2006, with a mandate to enhance the economic integration and development of member states of the Eurasian Economic Community (EurAsEC). Upon successful completion of its first medium-term strategy in 2010, EDB’s mandate broadened to include supporting member countries affected by the global economic and financial crisis. What’s Behind Russia’s Eurasian Assembly – Analysis – Eurasian Review, November 1, 2012 – The immediate reason for the creation of the Assembly is, ostensibly, that Russia, Belarus and Kazakhstan are currently preparing to launch the Eurasian Economic Union in 2015 – with Kyrgyzstan and Armenia also exploring membership. Eurasec Court to hear first case – BSR Russia, June 29, 2012 – The court of Post-Soviet economic bloc EurAsEC will hear its first ever economic dispute on Tuesday….Experts quoted by the paper say the lawsuit aims to draw attention to economically unjustified administrative barriers in trade between the EurAsEC member states, Russia, Belarus, Kazakhstan, Kyrgyzstan and Tajikistan. South Kuzbass is challenging some provisions of a decision by the Customs Union Commission, later renamed into the Eurasian Economic Commission, obliging companies exporting coal from Russia to file customs declarations. EurAsEC court to start in one month – chairman – RAPSI (Russian Legal Information Agency), Jan. 17, 2012 – The Court of the Eurasian Economic Community may commence working in one month, Chairman Evgeny Smirnov said at a Tuesday press conference in Minsk….Governments, private companies and businessmen will be able to appeal to the court in discrimination, competition law and equal business cases. EurAsEC leaders sign new deals on further integration – People’s Daily|Xinhua (China), Dec. 20, 2011 – The presidents of the EurAsEC [Eurasian Economic Community] member states — Russia, Belarus, Kazakhstan, Kyrgyzstan and Tajikistan, signed several documents on matters including the further buildup of the Russia-Belarus- Kazakhstan Customs Union, the Russia-Belarus-Kazakhstan Common Economic Space and the operation of the new EurAsEC court. Eurasian Union parliament idea under discussion – Belarusian Telegraph Agency, September 13, 2012 – Representatives of the parliaments of Belarus, Russia, and Kazakhstan are discussing the creation of a parliamentary body of the Eurasian Economic Union….The State Duma Speaker remarked that the sides would have to determine whether it would be a full-fledged parliamentary body to be elected via direct vote or whether it would be a parliamentary assembly with delegates sent by the parliaments of the three countries. Putin wants to discuss the creation of the Parliament of EurAsEC – Charter ’97 (Belarus), May 29, 2012 – The parliament will be formed at the Eurasian Economic Union and then the Eurasian Union. Eurasian Parliament might be created in near future – TVR (Belarus), May 18, 2012 – So far there are two options – either it will be the Eurasian Assembly consisting of already elected MPs of the three countries, or an institution similar to the European Parliament with direct elections and fairly broad powers…. The Belarusian speaker Vladimir Andreichenko confirmed that today the attendees discussed the “parliamentary dimension.” According to him, the Eurasian Union will be formed in 2015. Eurasian integration: step by step – The Voice of Russia, Dec. 20, 2011 – “This is the first supranational body in the history of our nations – a body to which our states have essentially given a part of their sovereignty,” [Russian President Dmitry Medvedev] says. “Its scope of authority will gradually broaden….He stressed that the Eurasian Economic Union is open to accession by new members, first and foremost by those from the CIS and the EurAsEC. Expert: cheaper Russian gas supply expected on Eurasian Union’s agenda – PanArmenian, August 27, 2012 – The problem of Russian gas supply to Eurasian Union’s new members below world market prices will be resolved in the framework of the Union, RA NAS Oriental Studies Institute representative said. Kazakhstan to supply oil to Belarus after creation of Eurasian Economic Union – PennEnergy, August 24, 2012 – Kazakhstan will supply oil to Belarusian refineries after creation of the Eurasian Economic Union, Kazakh ambassador to Belarus Yergali Bulegenov has said. Russia Uses Gas to Pressure Armenia on Eurasian Union – ArmeniaLiberty.org (press review), August 16, 2012 – “Hraparak” says that the price of Russian gas is Russia’s only strong lever for exerting pressure on Armenia. “Russia sells gas to Armenia at a price slightly below the market level,” writes the paper. “Armenian government representatives are in no rush to specify Armenia’s official position on the Eurasian Union. With free-trade pact ratified, Ukraine to seek natgas pipeline access – Ukrainian Journal, August 31, 2012 – Ukraine, citing a recently ratified free trade accord, will seek to get access to the Russian natural gas pipelines to start imports of gas from Central Asia, a senior official said. Russia’s Putin dreams of sweeping Eurasian Union – Atlanta Journal-Constitution, Jan. 3, 2012 – Russian Prime Minister Vladimir Putin has a vision for a Soviet Union-lite he hopes will become a new Moscow-led global powerhouse. But, his planned Eurasian Union won’t be grounded in ideology: This time it’s about trade. Common Economic Space Starts Work – Telegraf.by (Belarus), Jan. 2, 2012 – According to President of Russia Dmitry Medvedev, the parties will implement a project of the Eurasian Economic Union by 2015. At the same time his Belarusian counterpart Alexander Lukashenko is convinced that the Eurasian union will be formed much earlier – by the end of 2013. Stratfor: “Russia lays the groundwork for the eventual formation of the Eurasian Union which it is hoping to start around 2015” – APA, Jan. 17, 2012 – “Russia will continue building its influence in its former Soviet periphery in 2012, particularly by institutionalizing its relationships with many former Soviet states,” says US Stratfor Global Analytical Company’s Annual Forecast 2012, APA reports. A more assertive Russia: consequences for Ukraine – EurActiv, June 8, 2012 – The final goal apparently is the Eurasian Union (EAU), where Moscow will have the last word….In this context, the authorities in Kyiv are set on an uncontested course of deepening of integration with Moscow. A wider presence of the Russian capital in Ukraine is expected, with the Ukrainian big business having to cede ground. The Faustian Bargain – New Eastern Europe, April 23, 2012 – After nearly two decades in power, authoritarian leader Alexander Lukashenko brought Belarus to the brink of economic ruin….Russia stepped in with the offer that Lukashenko had long resisted: cash for control of Belarus state-owned assets….For then-Russian Prime Minister Putin, this was another step in advancing his idea of creating a Eurasian Union. Eurasian Union should become national project – State Duma deputy – Itar-Tass News Agency (Russia), July 1, 2012 – The Eurasian Union should stop being the idea of political elites and gain the status of a national project, Chairman of the State Duma Committee for CIS Affairs and Relations with Compatriots Leonid Slutsky said….Only 48% of Russians supported integration on the post-Soviet space, and 10% of them knew about the formation of the Eurasian Economic Union, the lawmaker said. Georgia tells EU to ‘open its eyes’ on Russia – EurActiv, Nov. 30. 2011 – Western politicians need to open their eyes to what is going on around Russia, where Prime Minister Vladimir Putin is building a modernised Soviet Union through his ‘Eurasian Union’ plan, says Giorgi Baramidze, Georgia’s vice prime minister. Expert: ‘Eurasian Union will claim not only economical but also political changes’ – Times (Armenia), Nov. 23, 2011 – Belarusian President has already underlined that the common currency would be very proper and he was “for” it. Putin Sets Sights on Eurasian Economic Union – Financial Times (London), August 16, 2011 (Google link) – Twenty years after the Soviet Union collapsed, Vladimir Putin, the Russian prime minister, may not, as is sometimes alleged, be trying to recreate it. But he is pursuing a different project – to build a “quasi-European Union” out of former Soviet states….At a Moscow summit this month, prime ministers of the three states set an even more ambitious target – turning the grouping into a “Eurasian economic union” by 2013. There is even talk, down the line, of a common currency. Putin sets priorities in foreign policy – Voice of Russia, May 12, 2012 – Another key direction of Russian foreign policy is economic integration with CIS countries. In this regard, we can highlight the ratification of the CIS Free Trade Zone Agreement, and the framework for the Union State, a coalition between Belarus and Russia. In addition, the development of the Customs Union and the Uniform Economic Space of Russia, Belarus and Kazakhstan with the goal of creating the Eurasian Economic Union by January 1, 2015. Putin wants to discuss the creation of the Parliament of EurAsEC – Charter ’97 (Belarus), May 29, 202 – The parliament will be formed at the Eurasian Economic Union and then the Eurasian Union. Ukraine must choose beween West or Russia: Polish leader – The Financial (Ukraine), September 21, 2012 – Ukraine’s Soviet-era master Russia has been pushing for closer ties, hoping Kiev could one day join a so-called Eurasian Union, a project championed by Moscow ‘s President Vladimir Putin. Moldova — At the crossroads between Russia and the European Union – Digital Journal, September 20, 2012 – Russia has significant strategic interests in Moldova. Russia has already outlined its aims to create a Eurasian Union, an economic and political entity comprising many of the members of the former Soviet Union and centered around Moscow. Vestnik Kavkaza (Russia), August 28, 2012 – Former Interior Minister and adviser to the first President of Armenia for national security, Ashot Manucharyan…in an interview to VK….As for the economic and global component, the Eurasian Union for all of us is a chance to break the existing system….I do not see another chance for a breakthrough for Armenia today, including integration into Europe. 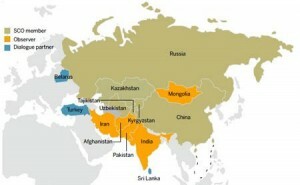 The future of the Eurasian Union – Voice of Russia, August 10, 2012 – There were proposals to expand the alliance to include, in addition to the already formed “Eurasian trio” (Russia, Kazakhstan and Belarus), new members: Ukraine, Tajikistan, and Kyrgyzstan. And in the future, it could even include countries that were not part of the USSR (for example, Turkey). WTO entry not to hinder Russia’s Eurasian Union efforts: senior lawmaker – China Daily, July 11, 2012 – Russia, Belarus and Kazakhstan have agreed to set up a Eurasian economic union, an EU-style intergovernmental economic mechanism, in 2015 to facilitate the free flow of people, capital and goods.